Earlier this week we shared with you the benefits of raised bed gardening, especially for those who are limited in their gardening enjoyment by knee and back issues. When you are creating raised garden beds you have several options with both materials and design. 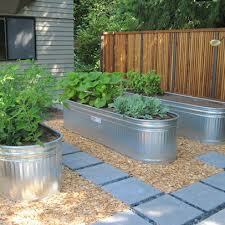 Raised beds can even be made out of repurposed objects. No, we’re not talking about the old truck tires that were once popular flower beds, but there are a number of interesting items that can be converted to gardening use. For example, you can buy a new galvanized metal horse-watering trough and will provide a modern look when planted with tall grasses and cascading vines. Or if you’ve got an older country-style home, perhaps an old horse trough discovered at a farm auction could be just the right touch. You can also build raised beds out of cedar (untreated) boards so they blend into the environment. Transitional raised beds out of concrete, brick or stone can be staggered down a slope. Whatever you choose, raised garden beds need to work with your overall landscape design to create harmony in your yard rather than looking out of place. A creative landscape design architect can help you make wise choices for your yard. One example would be creating raised beds as a focal point with walking paths between the different plots. Your raised beds could be a set of four garden beds divided by brick or stone walking paths. A focal point in the middle of the square could offer a bench to reflect a fountain to draw butterflies, birds, and other wildlife. If you enjoy do-it-yourself projects, simple raised beds can be created in a couple of hours. The first step is to prepare the ground directly under the raised bed. Take out any lawn and weed as if you were preparing a garden bed. Lay down a landscape cloth layer so you can keep wildlife out. Check out the sun exposure in your yard, you will want to focus on the north-south sun movement when you select the spot. While raised beds are going to provide better soil drainage than a typical garden bed you still want to consider the drainage in your yard. You want to make sure that water flows away from the raised bed you are building. Make sure that you have planned for at least 6” of space for plant roots. The final step after the container is built is to add the soil. Use soil that you’ve determined meets your planting needs and stops about an inch from the top of the edge of the container. If you really like the idea of raised garden beds for your yard but know that the process is more than you’re willing to take on, please call us to discuss your ideas; we’ll help you bring them to life.